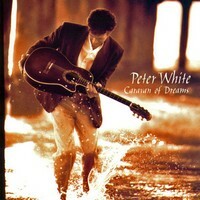 ‘Caravan Of Dreams’ was Peter White’s first album for Columbia. With its follow-up ‘Perfect Moment’, they constitute his best work. Produced by the legendary Paul Brown (‘Mr Smooth Jazz’), ‘Caravan Of Dreams’ epitomizes what White’s music is all about – strong writing, catchy hooks and exquisite faultless playing. Innovative ? May be not. Enchanting ? Definitely yes. His unassuming personality is reflected in the gentle nature of the material such as ‘Caravan Of Dreams’, the laid-back classic ‘Venice Beach’ and the infectious ‘Long Ride Home’ On the latter, Rick Braun shares the spotlight with Peter White’s hugely melodic acoustic guitar. The music on ‘Caravan Of Dreams’ is unpretentious – it is what it is – and perfectly executed.